Our friends Josef & Willemijn, aka 'Our Dutch family' as we call them, come to Lacoste every summer and ever since they installed their own pizza oven in their outdoor kitchen we relish an invite to come make pizza. We arrive as the sun is sinking, transforming their forest garden into a mystical place bathed in warm golden rays of evening sunshine. Life is good when we are surrounded by our favourite people and the smells of baking dough! What is not to love about pizza parties? 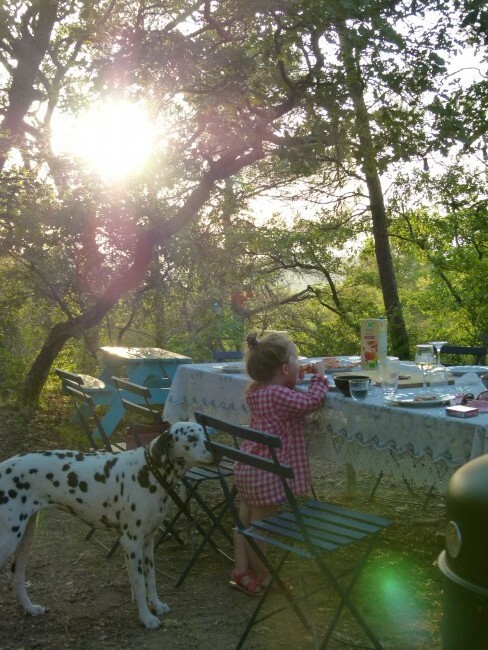 Their home is tucked away from everyone, in the wild, 'real' Provence of Lacoste. Nothing here is pruned or geometrical, rather nature takes over and every inch smells delicious, thyme, immortelle, rosemary and pine warmed by the sun. Louis's best friend of summer 2015, artist Michael Birch Pierce. The inseperable duo - even their pizza making is a beautiful choreographed ballet. And out of the oven they come - sliced up and devoured by hungry, happy people.